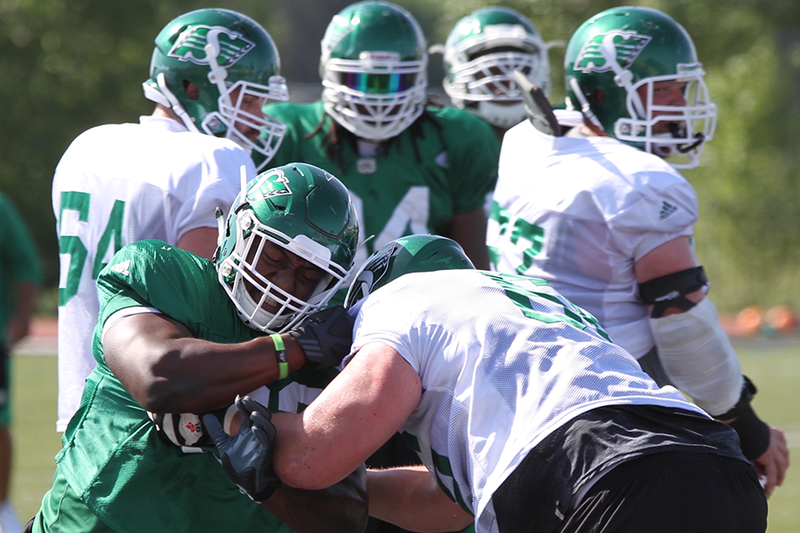 Former Huskie Tim Agbaje (left) rushing the passer during a drill in Roughriders training camp (photo by James Shewaga). 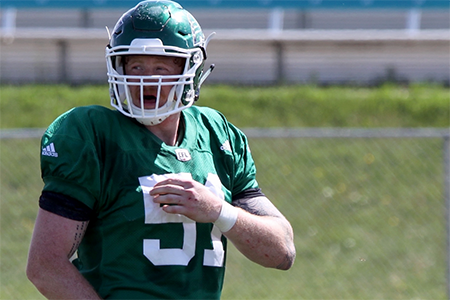 The University of Saskatchewan has rolled out the welcome mat for the Saskatchewan Roughriders in training camp, but no one feels more at home than Levi Steinhauer and Tim Agbaje. The two former members of the U of S Huskies football team are enjoying a little home-field advantage with Roughriders training camp based out of the Huskies’ facilities at Griffiths Stadium for the fourth straight year. In addition to the familiar surroundings, there are familiar faces at training camp, with U of S coaches lending a helping hand and former Huskie teammates supporting from the sidelines during practice. Steinhauer is also enjoying being back on campus, where the Huskies organization played a pivotal role in preparing him for pro football. “It’s great to come back to see some familiar faces, see some former coaches and some friends come out to practice and things like that, and obviously the facilities are first-class, so it is nice to be here again,” said Steinhauer, a 6-foot-3, 245-pound special teams standout who turned pro after being selected by the Roughriders in the fourth round (40th overall) of the 2013 Canadian Football League draft. This year, there is a new crop of coaches to impress at Rider camp for Steinhauer and Agbaje. Head coach and general manager Chris Jones has brought his own staff with him as the Jones era begins in Riderville. For Agbaje and Steinhauer—who was limited to only three games in 2015 due to a season-ending knee injury—that means proving themselves all over again. For his part, Agbaje has worked out on the offensive line in camp as well as in his regular defensive line role. Agbaje and Steinhauer could see their first action of the pre-season on Saturday night when the Roughriders play host to the B.C. Lions at Mosaic Stadium. Schmitt is the fourth former Huskie athlete going to the Olympics, along with wrestler Jillian Gallays, shot putter Taryn Suttie and wheelchair basketball athlete Erica Gavel. U of S women’s basketball coach Lisa Thomaidis will also be going to the Olympics as head coach of Canada’s women’s team, which currently has 24 players on the roster including CIS all-Canadian Laura Dally of the Huskies. Dally is battling for one of 12 roster spots on the Olympic team and is overseas this week suiting up for Canada in a five-game exhibition series in France and Spain. The 23-year-old Dally was named the Canada West conference’s most outstanding player and the U of S female athlete of the year after leading the Huskies to their first national championship title in March.